GreenPois0n RC5 3 has been released for Mac OS X, this is the third update to RC5 for Mac that provides an untethered jailbreak for iOS 4.2.1. RC5 3 includes several significant bug fixes in addition to native Mac OS X 10.6 and 10.5 support. Windows users can download GreenPois0n RC5 from here. GreenPois0n RC5 works with all iPhone models, in addition to iPad, iPod touch, and Apple TV2. 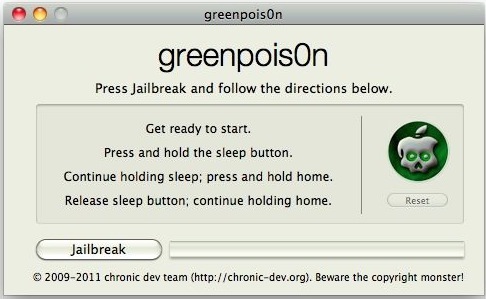 If interested, you can learn how to jailbreak iOS 4.2.1 untethered using GreenPois0n RC5 with our walkthrough. Hey, i ve already jailbreak, should I re-jailbreak wwith this new realease? Stop posting every damn RC release. This is not a dev blog for jailbreaks! Quit whining!! Thanks and here’s a tissue!! I’ve just used RC5-2 yesterday on 2 brand new iphone in v4.2.1. Jailnreaked without problem apparently, even id cydia icon was a bit slow to come (only after installation of another app) – BUT – sync with itunes seems to be bugged on both devices. I’ve installed installous + a few official & cracked apps (very common ones) and now itunes seems the sync process never comes to an end – it stays blocked at first step and I have to stop sync on the iphone or remove the cable. Any tought?